Regardless of which myriad outcome we end up with, there is no escaping Brexit — even in the art world. When Article 50 was triggered in 2017, Sky Arts responded by inviting 50 artists from various disciplines to consider what it means to be British. They have invested £2 million in the project, which begins today with a four-part series, plays and art works across the country. The show must go on. Here’s how Brexit has been a universal theme in the arts. Protest works are proliferating in visual art, says Standard art critic Ben Luke. There are Jeremy Deller’s T-shirts for the House of Voltaire, featuring pastiches of famous designs reworded so that they’re about Brexit. Think “Frankie Says F**k Brexit”. They were the unofficial uniform of Saturday’s People’s Vote march. Meanwhile, Mark Wallinger has designed a poster appearing on billboards all over London called This Way Up. It shows Theresa May upside down, accompanied by the proto-socialist words of Gerrard Winstanley, the 17th-century leader of the True Levellers. 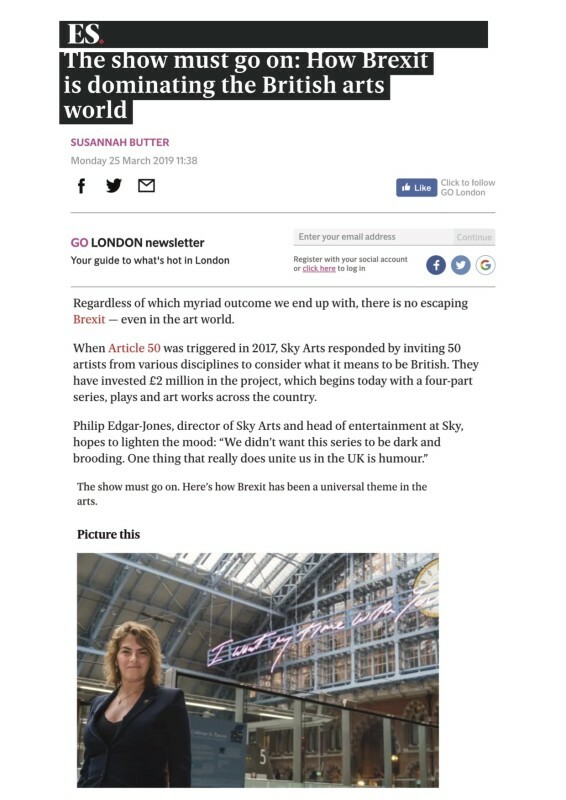 Tracey Emin’s neon installation at St Pancras implores Europe: “I Want My Time With You”, while the Martin Parr show at the National Portrait Gallery has a section called Britain at the Time of Brexit, and Rachel Maclean did a VR piece at the Zabludowicz Collection recently that Luke says “was like a sardonic post-apocalyptic nightmare of post-Brexit London”. On March 29 — the day that was earmarked for Britain to exit the EU, the House of Illustration is opening an exhibition of satirical embroidery by YiMiao Shih, inspired by Brexit. She imagines that, rather than voting to leave, we voted for the expulsion of rabbits from the UK. In practical terms, Brexit is already affecting art — the work showing at the Venice Biennale is being shipped ahead of March 29 (even though the event doesn’t open until the second week of May) to prevent any no-deal delays.